Gayatri is trying to find meaning of her life. With her father’s constant pressure, she has lost the real pathway that can lead her to her dreams. Viraj is at the peak of his career and it’s always his way in the office. But something happens and he has to mould his methods due to some reasons. What happens when people start interfering in each other’s lives sometimes for good and sometimes for inducing troubles? Will the quest to find the perfect road come to an end? The title is as fascinating as the name of the other two books of the series. No comments on that. The cover on the other hand was very extravagant. With elements which were infused in the tale can be seen on the cover and what else can celebrate the essence of love then red colour and cute hearts. The two leads were shown in full form and there nature can be seen in their postures and facial expressions. I simply loved both the title and the cover. The characters placed a cherry on the top. There were so many and they were so lively that it felt I knew them for a long time. From all the major characters I loved Gayatri, Viraj, Nandini and Sneha. They all were very opinionated and strong. They were connecting well with me and were definitely complimenting the moving tale. From the minor characters I liked Sana, Gayatri’s father and Viraj’s mother. These characters made the book reach the zenith. They had a very strong influence on the story in a great way. The narration was smooth, chapters were easy to understand and they were named well too. The tale could have been monotonous but the narration took the things to another level. It was on a perfect path, nothing less, nothing more, just perfect. The third book in the series is my first read and I was not certain if I would be able to connect with the characters well. But thanks to the author, she has managed to bring all the important details from her previous book in the present one to make the reading a worthy experience. In the very start a perfect characterization was done and every person was handled with care in the introductory section itself. I loved the fact that the author didn’t jump on the story directly but allowed the characters to breathe for a while and let their readers know that what they are up to and what can be expected from them. It gave a very large mirror to inspect things closely in the long run. Further the story was appealing no doubt. There were incidents of bravery, rage, envy and what not. I liked the way the story moved, step by step; peculiarly, baby steps. Yes I felt that the story was moving a little slower at times. The incidents were dragged a bit where the necessity was not felt. The advancements in the lives of different characters are smooth and I didn’t feel any negligence on the part of author. The best part was the way an incident with Gayatri was portrayed. I felt that the pros and cons were shown at large by the author. She was shown to be at a vulnerable spot after what she experienced and also how that helped her in the long run to connect with the people around her in one way or the other. Story was a mixture of aspirations and reality which Gayatri faced. The way things moved in her life must be analyzed by the readers and they must think hardly about the way decisions were taken and how everything combined to form a perfect stage for celebration. I think in a way the author has perfected the art of sending a message in lesser words and more of actions. When there are highs, lows are also in the way. The story was going good until everything was laid in front. All the suspense was over and then came some more chapters which I felt were lowering the whole episode. I didn’t find them to be interesting as compared to the rest of the story. There elimination couldn’t have made any difference. 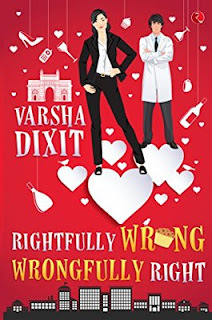 Summing up- Rightfully Wrong Wrongfully Right was a great book with light amount of everything, love, jealousy, friendship, brotherhood, courage etc, packed in a good form. Varsha Dixit has done full justice to the story but no doubt some eliminations would have saved the repo of the book. Nevertheless, the book was a light read with a nice balance of all the things making it a complete package for rejuvenating oneself. • Easy and smooth writing. • No hitches, no hasty moves. • Great characters, very vivid and highly energetic. • Last few chapters seemed out of place. • There were lesser amount of shocks and turns making it a simple tale without many surprises. Romance lovers can pick the book without much delay and second thoughts. Light entertainment guaranteed. Varsha dixit is the author of bestselling novels, “Right Fit Wrong Shoes”, “Xcess Baggage”, “Wrong Means Right End” and “Only Wheat Not White”. She worked in the Indian television industry before moving to the US with her family. Varsha actively interacts with readers through her website and Facebook author page.